Four decades before Edie Windsor took her case to the Supreme Court and argued that the government's refusal to recognize her marriage to her late spouse, Thea Spyer, Edna Knowles and Peaches Stevens were making headlines for marrying the woman of their dreams, legal recognition be damned. The Pop-Up Museum of Queer History tracked down the photo below, which appeared in the October 15, 1970 issue of Jet magazine. 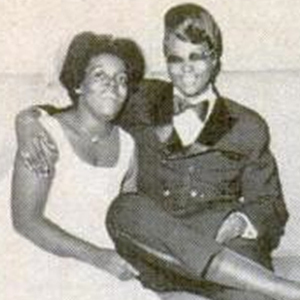 Edna Knowles, left, and Peaches Stevens were married at a gay bar on the South Side of Chicago, "before a host of friends and well-wishers," according to the Museum. Of course, lest the article appear to portray the loving couple in too positive a light, the headline puts the word 'Married' in quotes, and the image caption refers to Stevens as the "bridegroom," also in quotes. For those unsure, putting editorial copy in quotes like that implies that the word is used facetiously or in a satirical, inauthentic way. Still, doesn't the couple just seem over-the-moon with love and joy? Also, Stevens' hair is spectacular and I'm a little envious.